Similiar to the FX BOLT EA the Retracement EA trades spikes in the direction of the initial move. The difference lies in the timing of the entry. While FX BOLT EA opens a position using a MARKET order in the direction of the spike as soon as the data is available, Retracement EA calculates the initial spike, waits for the market to retrace and places a LIMIT order at critical Retracement points. Because markets very often become rapidly overbought after a news announcement. Too many people jump on the bandwagon of the announcement. Traders get trapped at the end of the spike and those who got in early take profits following the initial move. This generates pressure against the initial move and the market fades. While the market fades people are pushed out of their positions until a new equilibrium point where the instrument becomes cheap again from a macro perspective. This is the moment where the second wave of traders jumps in to trade the instrument in the direction of the macro trend. Usually, this also brings in higher volume traders who were constraint by the thin liquidity right at the market announcement. Retracement EA analyses and finds the opportunities to jump on that second wave. The big advantage here is that you are trading a much more liquid market than right at the announcement. Thus, slippage, the biggest enemy of initial spike traders, is not a concern for you at this point anymore. These retracements have a tendency to follow a certain pattern. They are closely aligned with typical growth patterns numbers like Fibonacci numbers. MacroSpike uses the vast history of spike data and it’s proprietary spike analysis tools to gain information about potential entry points. The first phase of the spike may last anywhere from a few seconds to several minutes. This depends on the size of the initial spike and the liquidity of the instrument. 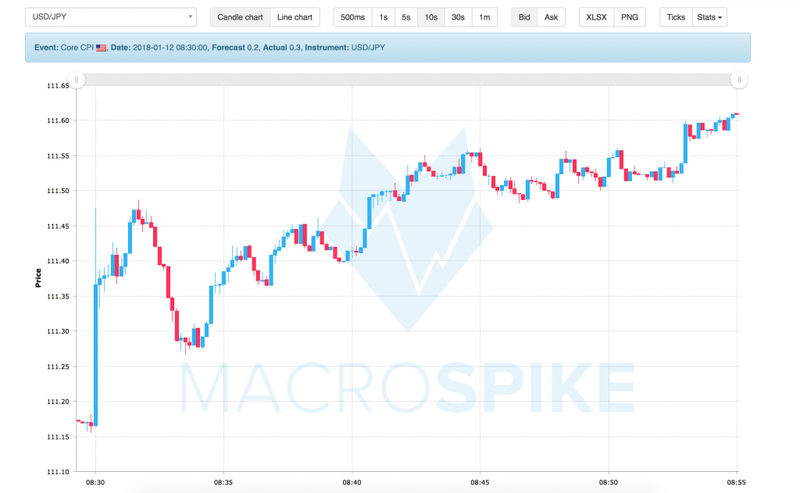 Following the January 2018 release of the US CPI numbers the USD/JPY spike 32 pips (111.16 – 111.48) in 90 seconds. The Dollar stalls and begins to retrace. At 08:33:30 it forms a bottom at 111.28, a 63% retracement of the initial spike. After that, the market resumes into the direction of the trend, making new highs than the initial spike high. 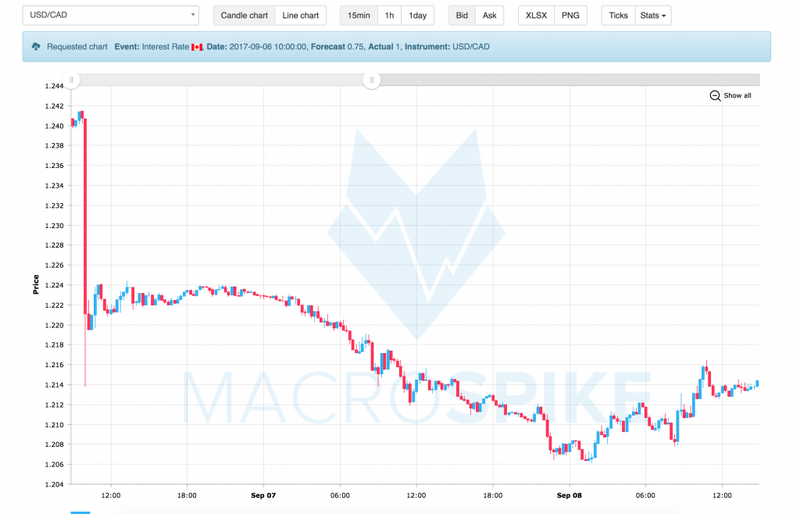 Following the surprising interest rate hike by the Bank of Canada in September 2016 the CAD spike 270 pips(1.2407 to 1.2137) against the Dollar. In the next 45 mins, the market retraced by 38%, finding resistance at 1.2240, before continuing to drift lower. Note how the market spike right into its 38.2 Fib-Level. Overall, this provided an opportunity for a 180 pips trade after spike.